Today: Mostly cloudy with temperatures dropping over the course of the day. Highs near 50. Overnight Saturday Night: Showers fill in after midnight, sleet and freezing drizzle likely by daybreak. Lows in the 30s. Tomorrow: Cold and raw with a wintry mix to periods of freezing rain. Highs in the lower 30s. Marathon Monday: Chilly and breezy with rain, heavy at times. Highs in the upper 40s. Saturday will feature our high temperatures early on before temperatures take a dive through the day. Ahead of the big drop in temperatures over the course of the weekend, a Winter Weather Advisory has been issued for all of Vermont, western and central Massachusetts, including Worcester County, and NW Connecticut, due to freezing drizzle and sleet expected for late Saturday into Sunday afternoon. This could make for slick travel along the higher terrain in interior Massachusetts. By Saturday evening, temperatures will be nearing the freezing mark north, 40s south. Snow showers kick off as early as 5 p.m. Saturday for those closest to the Canadian border, otherwise mostly cloudy south by dinner time. Showers start to fill in for most of New England overnight Saturday into early Sunday with interior Massachusetts, southern Vermont, southern New Hampshire, northern Connecticut plunging into the 30s with sleet and freezing drizzle likely, making for tricky travel through Sunday afternoon. Sunday’s high temperature will struggle to make it out of the 30s for most of New England. For the runners and for the spectators on Marathon Monday, be prepared for rain and wind. We start off in the 40s Monday with an onshore wind, meaning the runners will likely be battling with the wind for most of the race. By Monday evening, temperatures will reach near 50 for southern New England as a warm front slides in. With that shift, we could see a few heavy downpours at times. A cold front follows suit overnight Monday into early Tuesday, making for mountain snow showers in the higher terrain of northern New England, drier and slightly cooler conditions in southern New England for Tuesday with highs into the upper 40s. Wednesday looks to be the calm day out of the next work week, with Thursday and Friday into the 50s with a few showers. 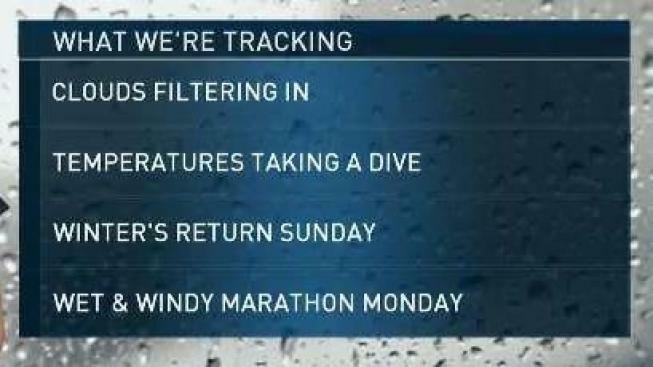 As always, stay tuned for the very latest updates to your weather forecast by downloading the NBC10 Boston / NECN app for weather alerts on the go.